The thing that keeps me interested in woodworking long term is the problem solving. In front of you are some real world problems facing you in real time and you have to use your accumulated knowledge and experience to solve those problems, preferably an efficient manner. The problem solving doesn't just fall into the "How will I connect these two boards together?" category either. Sometimes the most daunting problems fall along the lines of "How will I safely hold this board to work on it?" Note that safely is the key word in that sentence. I think back to the first time I used a holdfast. Epiphany. The first time I crosscut with a bench hook. Epiphany. Planing a moulding on a sticking board. Epiphany. Epiphany may be a strong word to some, but I can't come up with another word that would convey the little breakthroughs of understanding that accompany these positive experiences, and the following effect on my methods of work. Work holding can be a tough adventure. A good workbench is key, mine is kind of middling. 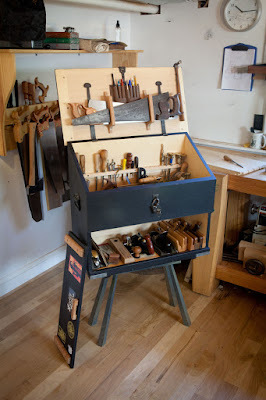 A good workbench should be able to hold a board so you can work on either the edge, the face, or the end, plus hold the appliances you need to accomplish various joinery techniques. My bench worked well in most of these categories. The operation I was unhappy with was holding a board to plane the face for flattening, thicknessing, and smoothing. Ideally one would use their wagon vise and bench dogs to hold for this work. Unfortunately I have and use dogs, but I don't have a wagon vise equipped on my bench. Instead I used a series of dogs stuffed in holes to push against like in this picture from a 15th century German manuscript. Two dogs on the end, sometimes with a thin "plane stop" (read offcut) stretched between them, and at least two more dogs along the far side. This system works well for working on a series of the same length boards. Traversing with the jack plane can be interesting if the board length doesn't fall in close proximity to the spacing of your dog holes. It's also difficult to work when you want the side of the board to hang off the side of the bench a little so you can get easy clearance with your plow or rabbeting plane fence. But I've made it work for years. Then I spend a little time cruising the youtube last week and I come across this video by Richard Maguire. 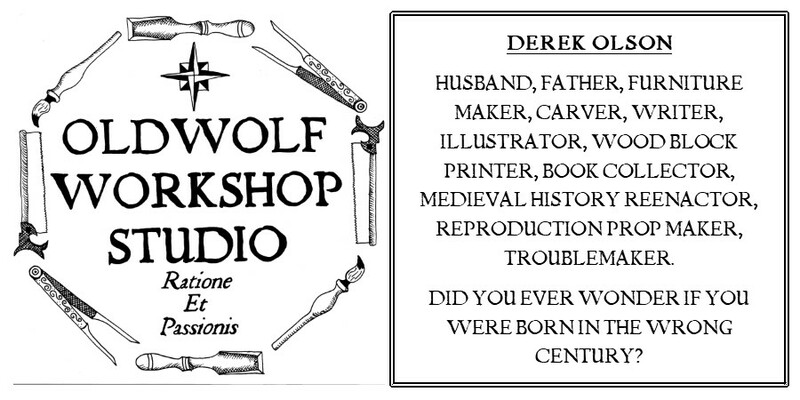 A fellow sawdust maker from across the Atlantic who calls himself The English Woodworker. He builds workbenches and has a very nice blog going, but the video that drew me in was pure magic and possible an answer to my workholding problems. He talks about an accessory to the holdfast called a Batten. A simple notch cut into the end of a thinner board and used with a holdfast to wedge your workpiece against a bench dog. Today I made it out to the shop early in the day with the plan to start rehabbing / rebuilding a craftsman style desk left at the house by the previous owner. It's in rough shape but my middle daughter begged to have it for her room and I promised to make it nice for her. But before I got to work sanding the grime and damaged finish off the salvaged pieces, I decided to make myself a batten. A piece of pine planed down to about 5/8" thick and a 90 degree angle notch cut in one end. You place one end of the workpiece against the dog and fit the batten to the other end. Securing it in place with the holdfast. Then you push into the workbench to wedge the batten against the workpiece, pushing it into the dog and holding it very securely. It works very well and in infinitely adaptable to board lengths and only requires pulling up the holdfast and moving it to a different hole, as opposed to banging out and moving up to three bench dogs like I used to do. I notice something new almost every time I look closely at it. Today I noticed what wasn't there. a wagon vise or end vise too. 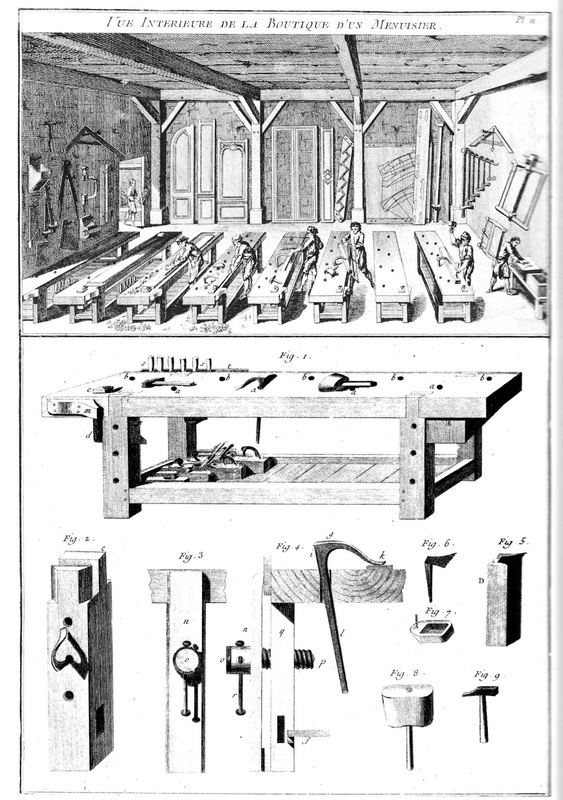 This, the ultimate of workbenches, is advertised as simple as a plane stop and a holdfast or two. The leg vise is optional. I knew there had to be something like the batten on one of the lesser worshipped plates. 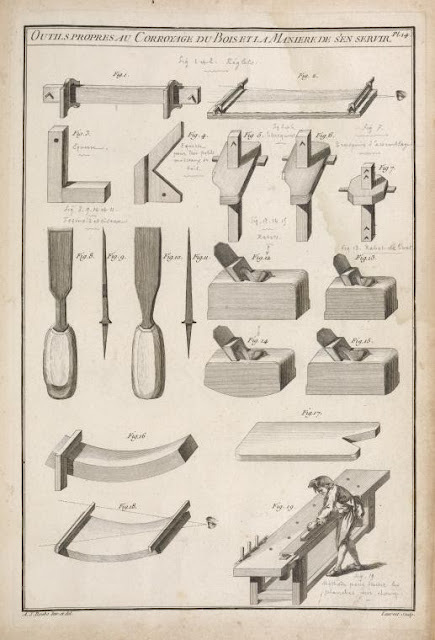 So I delved into the copies of the plates I downloaded from the New York Public Library website (You can view them all yourself HERE) and sure enough on plate 14 I found it. 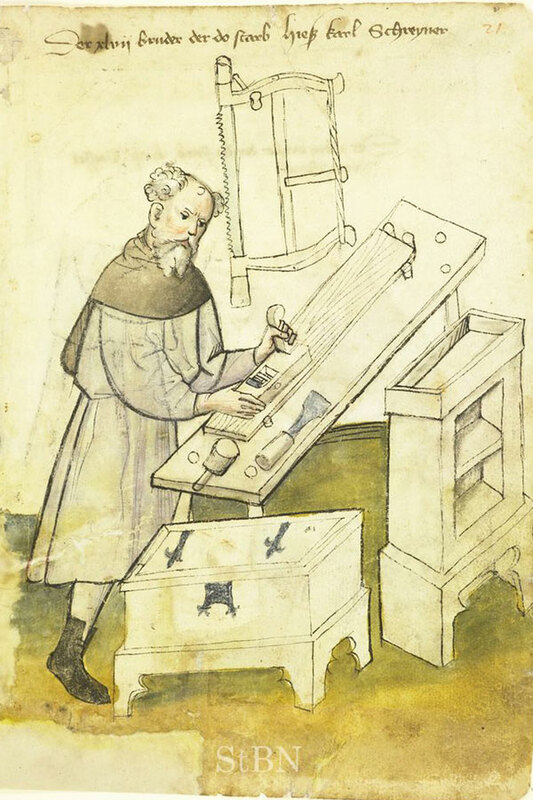 Figure 17, hanging out next to checking a board for square edges and using winding sticks. It's fun to find evidence for such a simple concept in these etchings. It's possible I have it wrong and figure 17 is described in the text (something I don't have a copy of and couldn't read if I did) as a support board for cutting fretwork with a turning saw or something similar. I'm sure someone will let me know if I'm barking up the wrong tree. I made of couple of these after seeing the same video. The first two I made split on me. They are subject to a lot of stress right at the corner. Howard from "All Hand Made" gave me a heads up and told me to drill a hole at the intersection. So far, I haven't split another one. Yes. This is such a handy tool. After I saw that video, I immediately tried it out. This 2 minute project made my work so much easier. I haven't split mine yet but the hole drilled is a good idea.